Article reposted from Genetic Engineering & Biotechnology News March 15, 2019. 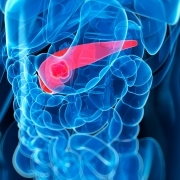 Scientists at the Karolinska Institutet report that the presence of oral bacteria in cystic pancreatic tumors is associated with the severity of the tumor. The team, whose study (“Enrichment of oral microbiota in early cystic precursors to invasive pancreatic cancer”) appears in Gut, hopes the results can help to improve the diagnosis and treatment of pancreatic cancer. 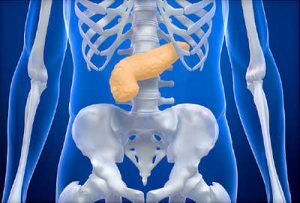 “Intraductal papillary mucinous neoplasms (IPMNs) are pancreatic cysts that can progress to invasive pancreatic cancer. Associations between oncogenesis and oral microbiome alterations have been reported. This study aims to investigate a potential intracystic pancreatic microbiome in a pancreatic cystic neoplasm (PCN) surgery patient cohort. “Paired cyst fluid and plasma were collected at pancreatic surgery from patients with suspected PCN (n=105). Quantitative and qualitative assessment of bacterial DNA by qPCR, PacBio sequencing (n=35), and interleukin (IL)-1β quantification was performed. The data were correlated to diagnosis, lesion severity, and clinical and laboratory profile, including proton-pump inhibitor (PPI) usage and history of invasive endoscopy procedures,” the investigators wrote. “Intracystic bacterial 16S DNA copy number and IL-1β protein quantity were significantly higher in IPMN with high-grade dysplasia and IPMN with cancer compared with non-IPMN PCNs. Despite high interpersonal variation of intracystic microbiota composition, bacterial network and linear discriminant analysis effect size analyses demonstrated co-occurrence and enrichment of oral bacterial taxa including Fusobacterium nucleatum and Granulicatella adiacens in cyst fluid from IPMN with high-grade dysplasia. The elevated intracystic bacterial DNA is associated with, but not limited to, prior exposure to invasive endoscopic procedures, and is independent from the use of PPI and antibiotics. Pancreatic cancer is one of the most lethal cancers in the west. The disease is often discovered late, which means that in most cases the prognosis is poor. But not all pancreatic tumors are cancerous. For instance, there are cystic pancreatic tumors (pancreatic cysts), many of which are benign. A few can, however, become cancerous. It is currently difficult to differentiate between these tumors. To rule out cancer, many patients therefore undergo surgery, which puts a strain both on the patient and on the healthcare services. Now, however, researchers at Karolinska Institutet have found that the presence of bacteria inside the cystic tumors is linked to how severe the tumor is. The researchers examined the presence of bacterial DNA in fluid from pancreatic cysts in 105 patients and compared the type and severity of the tumors. Doing this they found that the fluid from the cysts with high-grade dysplasia and cancer contained much more bacterial DNA than that from benign cysts. To identify the bacteria, the researchers sequenced the DNA of 35 of the samples that had high amounts of bacterial DNA. They found large variations in the bacterial composition between different individuals, but also a greater presence of certain oral bacteria in fluid and tissue from cysts with high-grade dysplasia and cancer. The results can help to reappraise the role of bacteria in the development of pancreatic cysts, she noted. If further studies show that the bacteria actually affect the pathological process it could lead to new therapeutic strategies using antibacterial agents. The researchers also studied different factors that could conceivably affect the amount of bacterial DNA in the tumor fluid. They found that the presence of bacterial DNA was higher in patients who had undergone invasive pancreas endoscopy, a procedure that involves the insertion of a flexible tube into the mouth to examine and treat pancreatic conditions thus the possible transfer of oral bacteria into the pancreas.